Cleos VIP Room was established in 2012, and in partnership with virtualspree.com is part of the Virtual Spree Promotion to give away Ten Million Dollars in Cash Prizes. Cleos is a unique promotional website where you can win real cash by playing the casino games. There is no purchase necessary. Since the beginning of this promotion, 750 players have already won an incredible accumulated total of $2,700,000. These winnings are only the game room payouts and do not reflect cash awarded to the ‘Lucky Raffle Tickets’ winners. The Daily ‘Lucky Raffle Tickets’ are worth $10 in cash, and a total of 2,469 players have already won an accumulated total of $218,620. The Weekly ‘Lucky Raffle Tickets’ are valued at $100 each, and a total of 416 players have already won an accumulated total of $66,800. The Monthly ‘Lucky Raffle Tickets’ is valued at $250 each, and a total of 115 players have already won an accumulated total of $33,500. The virtual casino floor of this online casino lavishes you in Egyptian mystery. The games are stunning and play very smooth. The colors are vibrant throughout the casino lobby and in the games. The games are also very unique… I have not seen anything like them anywhere else. I enjoy playing at this casino very much. however, the games are pretty tight in my personal experience. The games and software developed by Amuzi Gaming are certified by BMM Compliance Laboratories. The RNG for the games is in compliance with strict industry standards and is certified random and fair according to required operating procedures. Recently, Cleos VIP Room launched an Instant Play Casino, so you are no longer required to download and install the free software just to be able to enjoy the games there. Not only that, there are Instant Play games that are unique to the Instant Play Casino, and not available in the download version of the casino. Click any link on this website to go to the homepage of the website and you have the option to download and install the software if you prefer, or to try the all New Instant Play version of the casino. There are several free money bonuses available, and you are welcome to take advantage of every single one! You can also acquire credits to shop in the Virtual Spree Store, and the items available for purchase are quality products. The game selection is generous, there are mostly 5 Reel Video Slots with Multiple Paylines, however, there are some Table Games and other traditional casino games if you prefer to play something other than slots. Online transactions at Cleos VIP Room are protected with 128-bit encryption, and you can feel confident that your personal data is always kept confidential, safe, and secure. The cashier utilizes electronic and physical security to reduce the risk of improper access to or manipulation of information during transmission and storage of your transaction data and personal information. Download and install the Cleos VIP Room casino software. Then open a player’s real money account to receive $1 in Free Game Chips. Register a real money player’s account and Claim Promo Code by clicking our banner to get $50 in Free Game Chips. Existing members can email support@cleosviproom.com with a link to their favorite product from virtualspree.com online store to receive $2 in Free Game Chips. Purchase Virtual Spree (VS) Points in the cashier of the casino to receive the equivalent value in Free Chips to play the games with… use it for cash… you can also choose to use your VS points to purchase products, such as jewelry, handbags, briefcases and other accessories, home decor, home furnishings, and much more… from the Virtual Spree catalog. Then with your Free Chips, you can play the games and turn them into real cash winnings, and withdraw from your account if you have met all the requirements in the terms and conditions of the bonus. It is important to note that ALL Free Bonuses have terms and conditions that must be met before you can withdraw your winnings. It is worth mentioning that you do not have to make a purchase to be eligible to win. Register and log in to our lobby. Click on “Win Real Money”. Click on “Cashier” to purchase VS points. Exchange your VS points for equivalent value in Free Chips. Your account will be credited with the equivalent value in Free Chips. Play the exciting games using your Free Chips. Meet the 30X Playthrough Requirement with a remaining minimum balance of $250 to convert your account balance into cash. * You are not obligated to participate in the promotion. The VS points you purchase may be used immediately to obtain products from the Virtual Spree catalog. ** Playthrough requirements may vary depending on the type of game played. 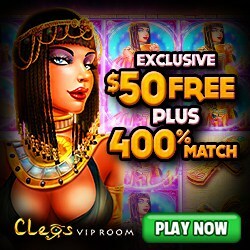 Join Cleos VIP Room and Get $50 Free to start playing the games without a purchase of VS points. This way you can test them to see if you wish to continue participating in the promotion. Simply visit Cleos using links from this website and register an account. Upon successfully registering your account, log in to the casino and go to the cashier (Click ‘Buy’ at the bottom of the casino lobby). In the cashier, enter the Promo Code in bonus box on the bottom where it reads ‘OPTIONAL No Purchase Required Coupon Code’… then click the ‘Apply’ button. In just a few seconds, the bonus will be instantly available so you can start playing the games and participating in the Virtual Spree Promotion. Ten Million Dollars in Cash Prizes will be given away during this promotion… so Join Cleos VIP Room and Start Winning Today!